How does legendary author Paula Wolfert coax so many great Mediterranean recipes from so many great cooks? "By hugging, kissing and measuring spoons," she proclaims. 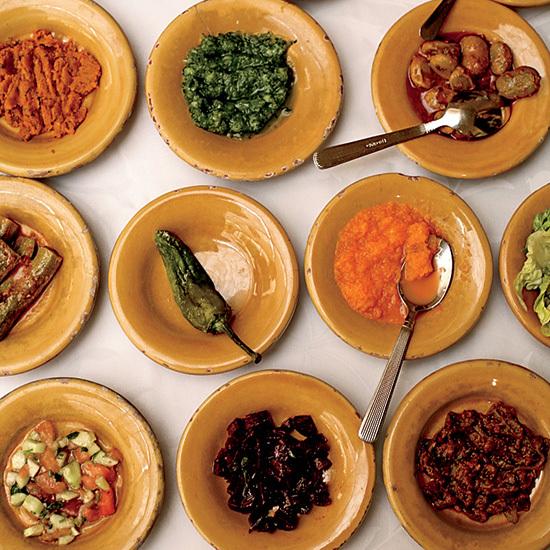 Here, she returns to Marrakech for the first time in two decades to search out the city's best new dishes. 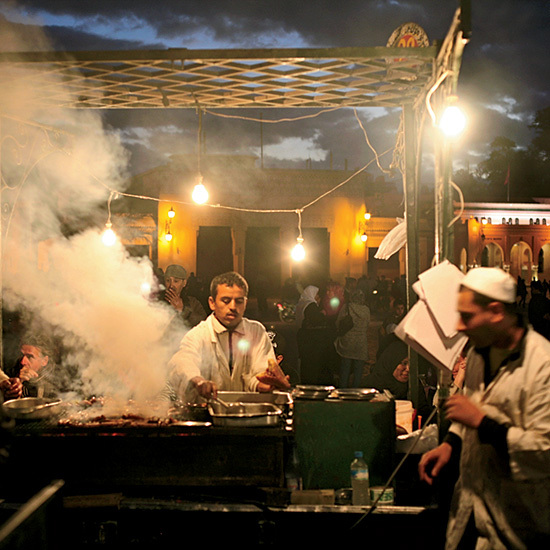 Marrakech's centuries-old central square in the Medina offers some of the city's best food at stalls identified only by number; stall 30 serves wonderful grilled merguez. The square can get crowded with henna painters, acrobats and snake charmers, as well as vendors who might give tourists a very hard sell. Paula Wolfert, however, says no kindly—and effectively—with the Moroccan phrase La, barak Allaho fik: "It means, 'God will grant you every wish if you leave me alone,'" she says. In the Guéliz neighborhood of Marrakech, the restaurant Al Fassia is famous for its vegetable dishes prepared by an all-female staff. Paula Wolfert embraces the hostess at Al Fassia after the two have a rousing discussion over mint tea about chef Halima Chab's roast lamb. Wolfert, who brings a maternal warmth to her relentless questioning, can charm almost anyone into sharing their food knowledge. 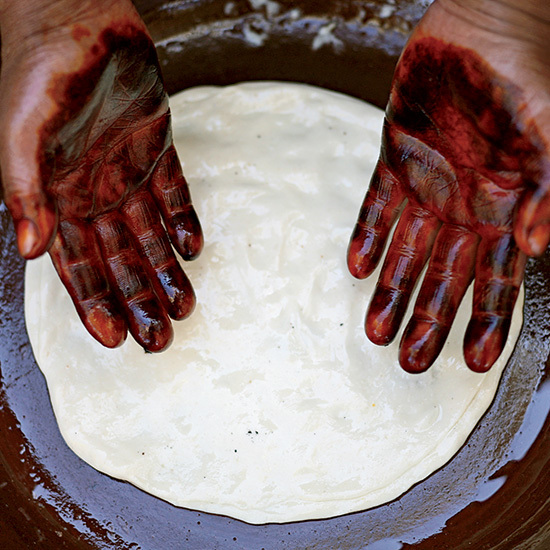 About an hour outside Marrakech, on a field trip to the Ourika Valley in the foothills of the Atlas Mountains, Paula Wolfert watched a private cook with hennaed hands demonstrate how to make the pastry for her rustic trid, a braised chicken dish. 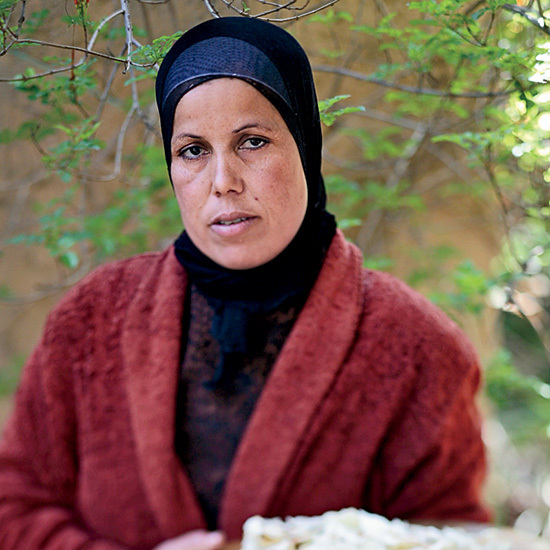 Anyone can take baking lessons at the nearby Jardin Bio-Aromatique d'Ourika, an organic herb farm and producer of argan nut oil, a Moroccan specialty. B.P 142 Tnine Ourika Haouz; nectarome.com. 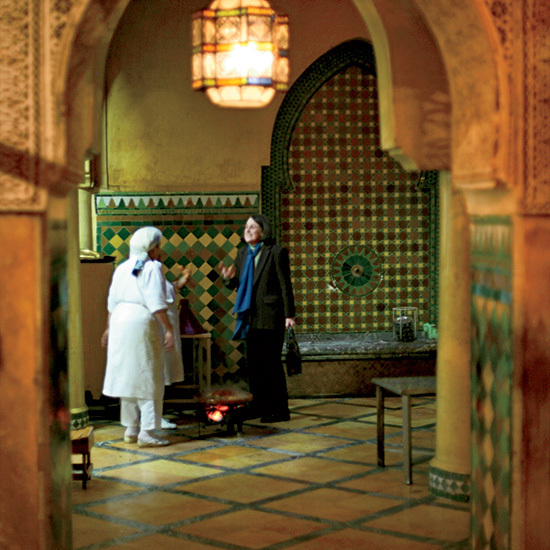 Paula Wolfert visited the kitchens of Dar Yacout, left, where the cooks still use charcoal fires to make dishes like lush and smoky roasted-eggplant salad. 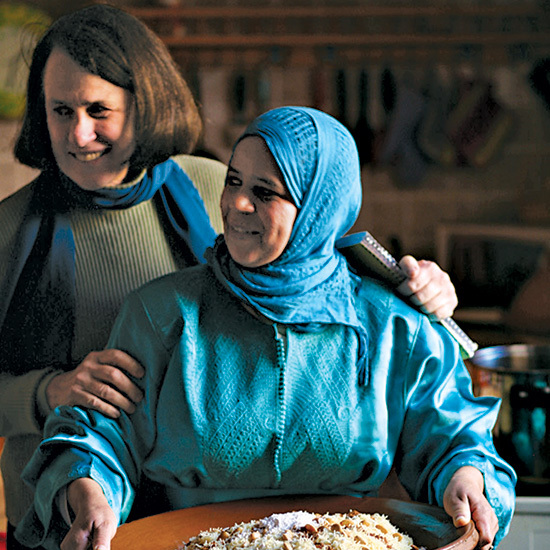 Paula Wolfert learned a chicken dish called chaariya medfouna from a private cook named Karima, left. "Chaariya means noodles," Wolfert says. "Medfoun means a surprise or something hidden.” In Paula’s adaptation, the steamed noodles cover tender chunks of lamb spiced with cumin. 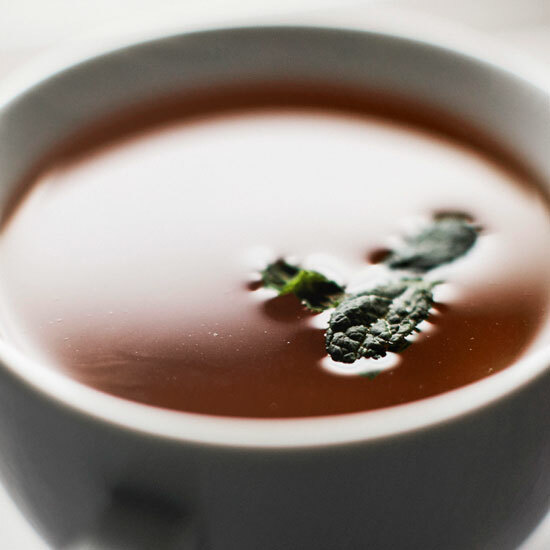 There are several great ways to end a meal in Marrakech, from a glass of mint tea to a dessert of poached pears with prunes. 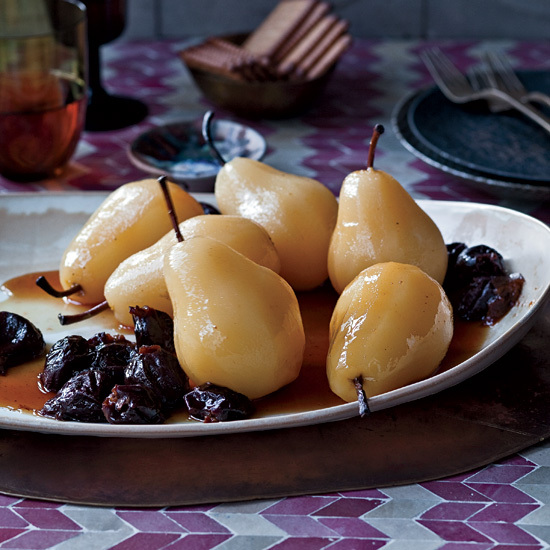 Paula Wolfert adapted this lightly spiced, unusual fruit dessert from one created by chef Fatima Mountassamin of Le Tobsil, Marrakech's most ambitious Moroccan restaurant.